March | 2012 | What about this? First impressions of this flower might be: prickly, exotic, and tropical. 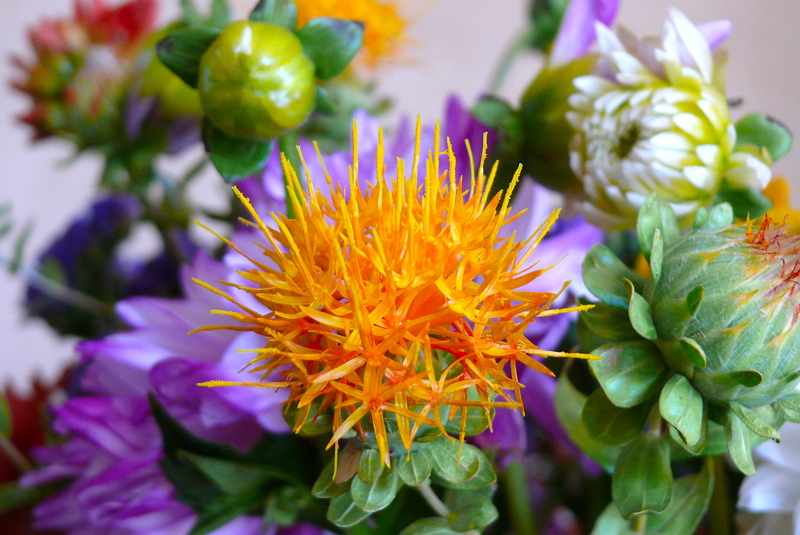 In actuality, this safflower is soft, familiar, and grown in areas with long dry seasons. The lesson here is that first impressions can be deceiving. Frequently, first impressions are instinctual, emotional, and based on uninformed beliefs. To try to live our lives with more open minds, we need to challenge our first impressions and our long-held beliefs. How can seemingly cold metal chain evoke such depths of emotion? Korean Artist Seo Young Deok tells stories of emotion by creating realistic human figures out of chains, welding each sculpture link-by-link. His stories are told by the poses of his pieces, the rawness of his materials, and the feeling of incompleteness. Have your taste buds ever been unwittingly tricked into believing you’re eating something sinful only to find out that you’ve been eating something healthier? Here’s a list from Greatist of 80 handy and healthy substitutions for you to try in recipes. For example, try substituting meringue for frosting on your cupcakes or crushed flax or fiber cereal for bread crumbs. Some shoes look really comfortable, but when you wear them they hurt. I’m not taking any chances. Even though my son’s wedding is four months away, I’m already breaking in my new pair of high heels. Thanks to The Beauty Department, I learned a few more ways to break in my shoes. I can’t tell you how many times in the past I’ve wanted to take a photo of something and then realized I didn’t have my camera with me. Thankfully, I now have a smartphone with a camera and have downloaded some camera-enhancing apps. Which camera apps are the best? Check out “25 Must-Have Apps For Your Smartphone” from Online Photography Colleges to see which camera apps suit your needs. Surprise crossed my face when, several years ago, my daughter informed me that Easter was her favorite holiday. “Really? Not Christmas?” I replied while thinking about all the years I attempted to create wonderful Christmas memories for my children. Holiday season after holiday season, colorful decorations covered every nook and cranny in our home and the scent of fresh pine mingled with the sweet smell of cookies baking. The Christmas holidays always sparkled with good times, love, and laughter. I listened while my daughter explained about her favorite holiday and soon my initial disappointment over perceived Christmas fantasies faded away. I hadn’t failed, after all. The good times, love and laughter I longed for my children to have, were not just restricted to one holiday. For my daughter, Easter brings the promise of spring, with its sense of renewal, fresh colors, and beautiful flowers. But it also brings back fond memories of silly egg dyeing experiments, crazy, competitive Easter egg hunts with her brothers, and much anticipated visits from her grandparents. She’s an adult now and home for only a brief visit, but I can still create good memories for her. She was childishly happy when I asked her, “Would you and your friends like to dye Easter eggs?” After gathering supplies, I let the three creative gals take over. 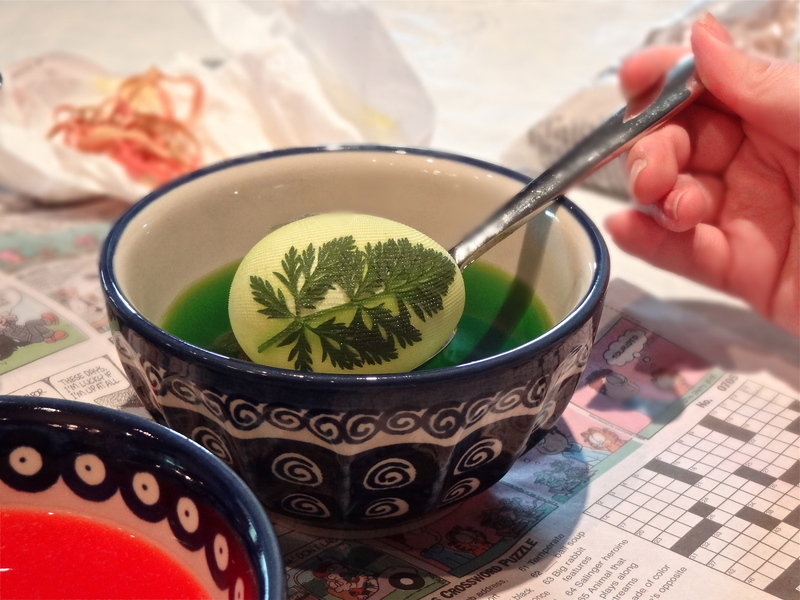 Below are tips and techniques on creative egg dyeing from my daughter and her friends. Electrical tape is great for cutting out shapes and sticking to an egg. Because it is so sticky, it can be used multiple times and is easily repositioned. Remember to gently smooth down all edges of the tape, so that dye does not seep under the tape and clean lines are formed. Plan ahead the sequence of colors you will be dipping – always start with a white egg or dye the egg the lightest color first. Let the egg dry between colors. Smooth, adhesive, shelf paper, such as Contact Paper, acts like electrical tape by blocking out dye, but the advantage the shelf paper has is that it can be punched out into shapes. Using paper punches, punch out shapes from the adhesive shelf paper. Peel off the paper backing, place shapes on egg, and smooth edges down. Dye egg as desired. Bigger and simpler shapes punch out better than small intricate shapes. Some shapes may require additional trimming with scissors. 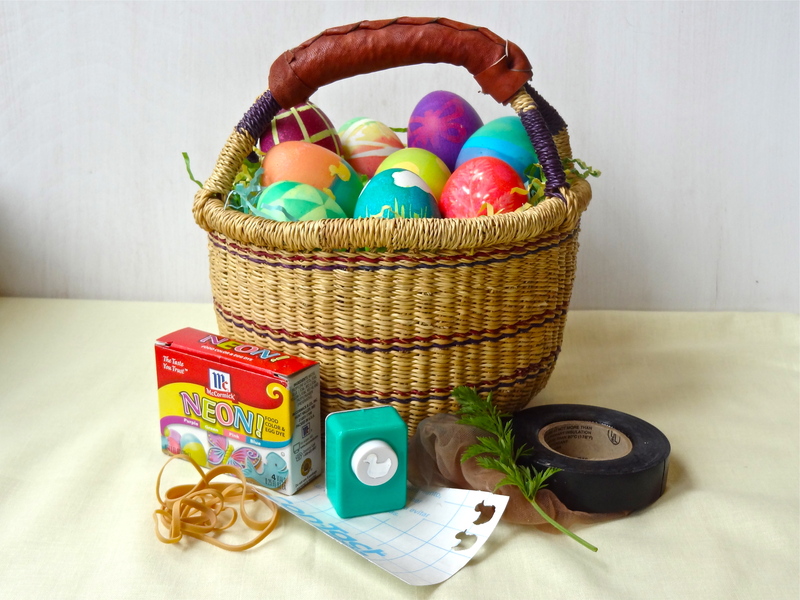 Wrap rubber bands tightly and securely around an egg. For more interesting and intricate designs, vary the width and number of rubber bands used. Dye the egg and let it dry. 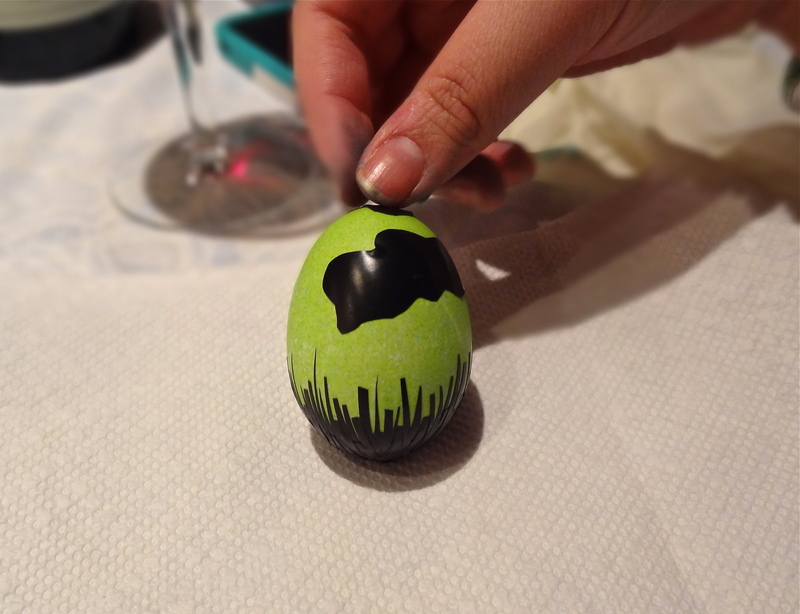 After drying, some of the bands can be removed and the egg can be dipped in another color. Select small leaves that can lie flat against the shell. Herb leaves and carrot leaves work well for this technique. Place leaf on an egg, being careful to spread and flatten all parts of the leaf. Cut out a piece of sheer pantyhose and wrap it around the egg. Twist stocking at the back of the egg and tie it tightly with a small rubber band or a piece of dental floss or string. Dye the egg. Let it dry completely before removing the stocking and the leaf. The nylon wrapped around the egg slows down the drying process. 1. The best way to hard boil eggs is to put eggs in a single layer in a pot and cover them with one to two inches of cold water. Bring the water to a boil and immediately reduce the heat to low. Let simmer for no more than a minute and then turn off the heat. Cover the pot and let the eggs sit for 10 to 12 minutes, depending on the number of eggs and the amount of water used. Drain water and run cold water over the eggs in the pot until they have cooled. Blot eggs dry before dyeing them. 2. Don’t rush the dyeing process and be sure to let the eggs dry between colors. 3. 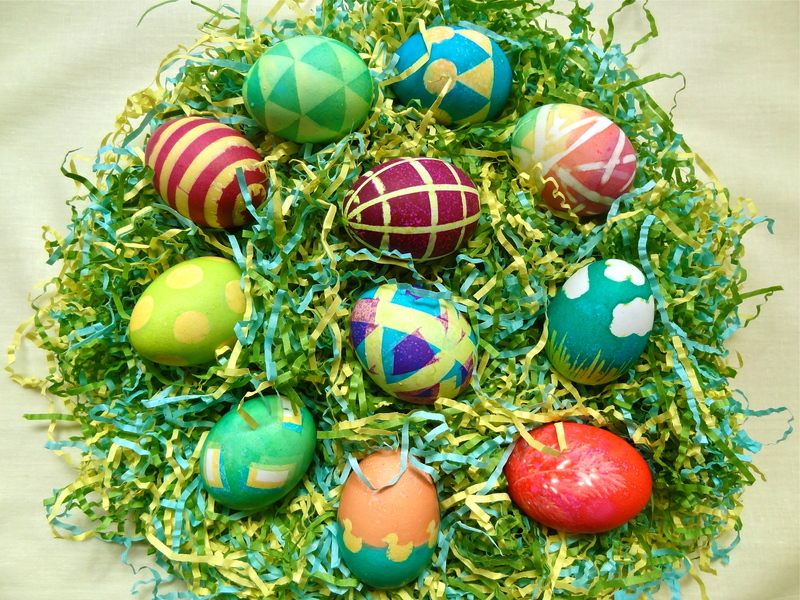 To avoid an egg from turning an ugly brown color, it helps to plan out the color sequence before dyeing each egg. 4. 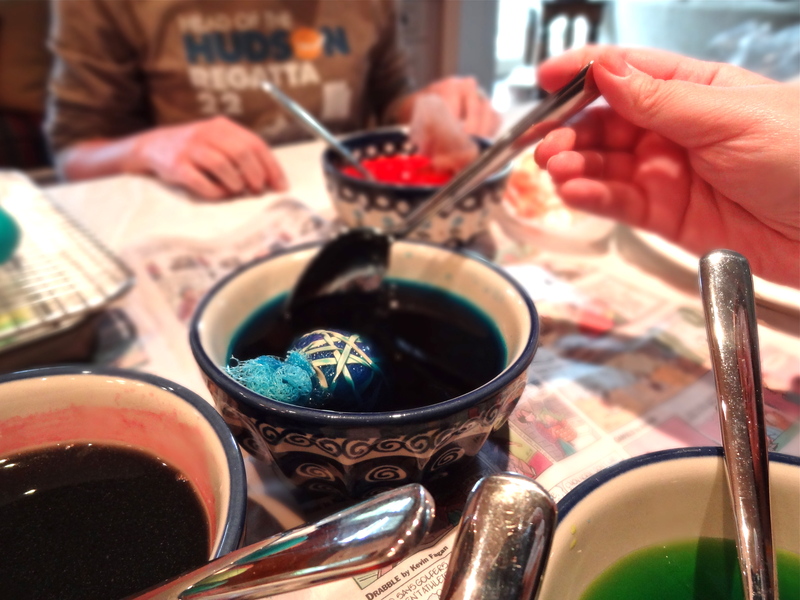 Keep hands clean to prevent dye transfer to other parts of the egg. 5. I lined a baking pan with paper towels and placed a cooling rack in it, to provide the eggs a place to dry. 6. Refrigerate completed eggs as soon as possible. 7. For another fun way to dye eggs, check out my post on Tie-Dyed Eggs. 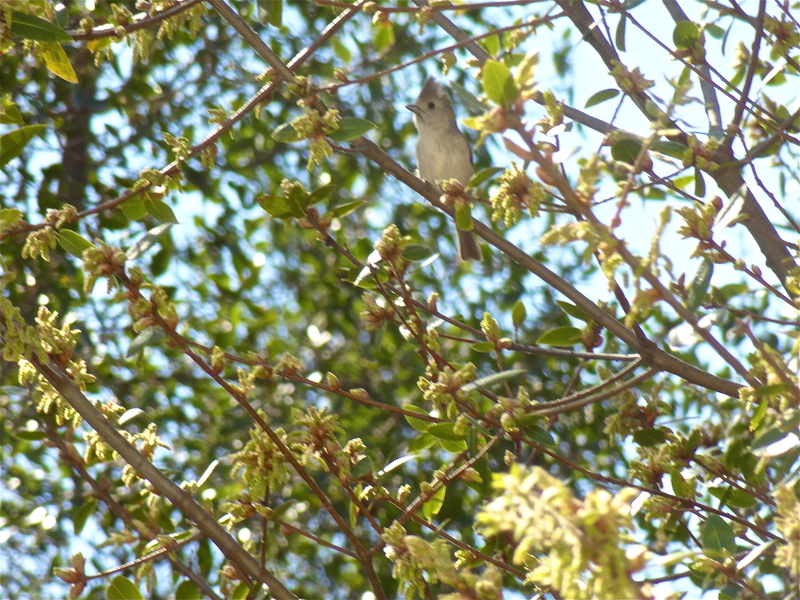 It was raining cats and dogs when I spotted a pretty bird perched on a tree in my yard. 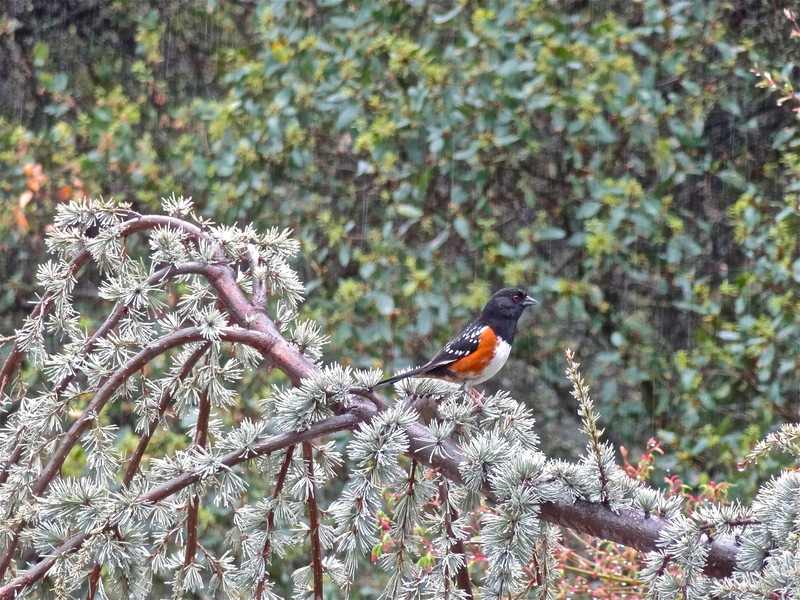 While other birds ate ravenously in the pelting rain, this Spotted Towhee was resting and taking in the sights. Here’s a lesson for us all – even in undesirable conditions, it’s always good to sit, regroup, and regain perspective. #1 – What Time Is It? Whether for business, travel, or staying in touch with friends and family, we all occasionally need to know what time it is in other parts of the world. With its easy slider bars, Every Time Zone makes it convenient to check the time in major cities worldwide. You will want to bookmark this site for future use! #2 – What Happened Back Then? Do you ever wonder what the world was like the year you or your parents were born? At What Happened In My Birth Year, all you have to do is type in the year you want to learn about and you’ll find out fascinating facts, such as popular songs and books, which movies were hits, who the movers and shakers were in the world, and so much more! Artist Riusuke Fukahori takes painting to a new dimension. Carefully layering paint and resin, he creates incredibly realistic 3-D goldfish. Watch the brief video of his painstaking process. It’s amazing! Toss 1 pound of asparagus with 1 tsp. of canola oil. Roast in a 400 degree F oven until lightly browned and tender, about 15 minutes. Drizzle with with 1 tsp. of toasted sesame oil, 1 tsp. of soy sauce, and a squeeze of lemon. Sprinkle with sesame seeds, Serve hot or cold. Want to know my secret to baking sweet and delicious treats and not gaining weight? The answer is simple: I give my baked goods away. Being on a mother-of-the-groom diet, I sample only one tempting serving and then pack up the rest for my husband to take to work. Today’s batch of Raspberry-Cherry Crumble Bars will be tomorrow’s staff treats. Oh, but these delicious crumble bars will be a little bit more difficult to give away. Tart cherries mixed with sweet raspberry jam and sandwiched in between a buttery oatmeal crust and topping are sorely testing my willpower. 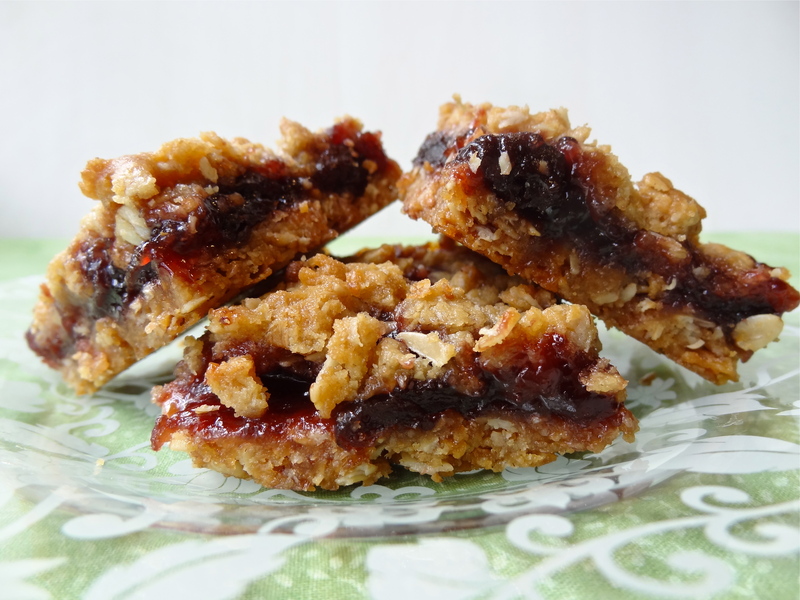 These easy-to-make bars are proving not so easy to give away! 1. Preheat oven to 350 degrees F. and position an oven rack in the center. Line a 9 by 13-inch baking pan with foil across the bottom and up the two long sides, then lightly coat with melted butter, oil, or high-heat canola-oil spray. 2. To make the crumble dough, place flour, oats, brown sugar, and salt in the bowl of a stand mixer and beat on low speed until evenly mixed (or place in a food processor and process for 5 seconds). Add the cold butter and mix on low speed until the mixture looks like wet sand and starts to form clumps, 5 to 6 minutes (or process for 45 to 60 seconds, pausing to scrape down once with a spatula). 3. Divide the dough in half. Pat one half into an even layer in the prepared pan. Set the other half aside. Bake for 20-25 minutes, until golden and crisp. Transfer to a rack and cool for 20 minutes. Leave the oven on. 4. Make the filling by emptying the jam into a medium bowl and stir well to break up any lumps. Add the cherries and stir until well-mixed and all the cherries are coated with jam. Spread evenly over the cooled crust, all the way to the edges. Sprinkle the remaining dough evenly over the filling. 5. Bake for 35 to 40 minutes, until the topping is golden brown and the filling is bubbling. Transfer to a cooling rack and cool completely. 6. To serve, run a thin knife or spatula around the edges of the pan to loosen any dough or filling. Lift the cookies out by using the foil as handles and place on a cutting surface. Cut into 3 by 1-inch bars. Just before serving, use a fine mesh strainer to lightly dust the confectioner’s sugar over the cookies. 1. It is important to line the baking pan with foil. It helps to lift out the finished product after it has cooled, which makes it easier to cut. Make sure to butter, oil, or spray the foil. 2. Tart cherries are the same as sour cherries. 3. The jam I bought came in an 18-ounce jar instead of a 16-ounce jar. I added the whole jar to the recipe without negative consequence. 4. I did not feel the need to dust the bars with confectioner’s sugar. The bars were perfect as is. The rain forces me to do things that I ordinarily don’t want to do. The idea of cleaning out cabinets and closets rarely appeals to me, but since there’s been nothing but rain this past week, I’ve been in a nesting/cleaning mode. My husband hates it when I go from a laissez-faire wife to a neat-freak wife, because he knows all too well about the ripple effects! #1 – In Love with Sumo! Citrus oils are well-known for their cleaning ability and many cleaning products are infused with a citrus scent, but when you peel your first Sumo mandarin, the last thing on your mind will be cleaning! 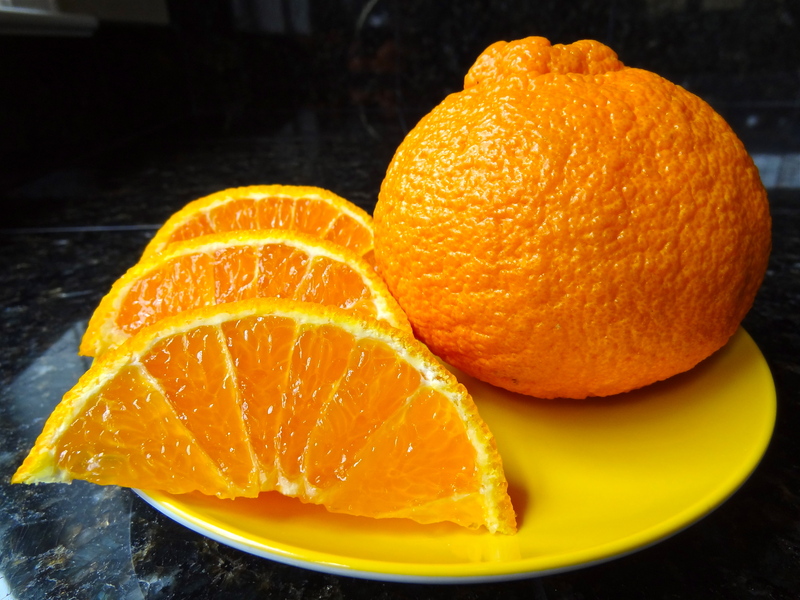 Sumo mandarins are the result of crossing a California orange with a Satsuma mandarin. They are seedless and are the size of oranges, but they are easy-to-peel and have an extremely sweet and juicy flavor, much like mandarins. Cut them in half crosswise and then into wedges to fully expose their beautiful flesh. Like other citrus fruit, they are high in vitamin C, foliate, fiber and potassium, but what’s even better, is that they are low in acid. Look for them in grocery stores now, but hurry! They are only available February through May. I found them at Whole Foods. You don’t need a bucketful of industrial strength cleaners and you don’t need to spend a lot of money on gadgets that make your life easier. Just take a look at Real Simple’s list of ideas that make housekeeping easier. For example, try using used fabric-softener sheets with a little bit of water to clean soap scum off of glass shower doors. There is beauty in everything, right? Now there’s a photography website to prove it. At Beauty in Everything treat yourself to an assortment of great photographs selected on a daily basis. The collections can be viewed by date or by subject matter. A dinner outing with friends to a new market/deli restaurant provided me with memories of a salad that I couldn’t forget and inspired me to try making it at home. 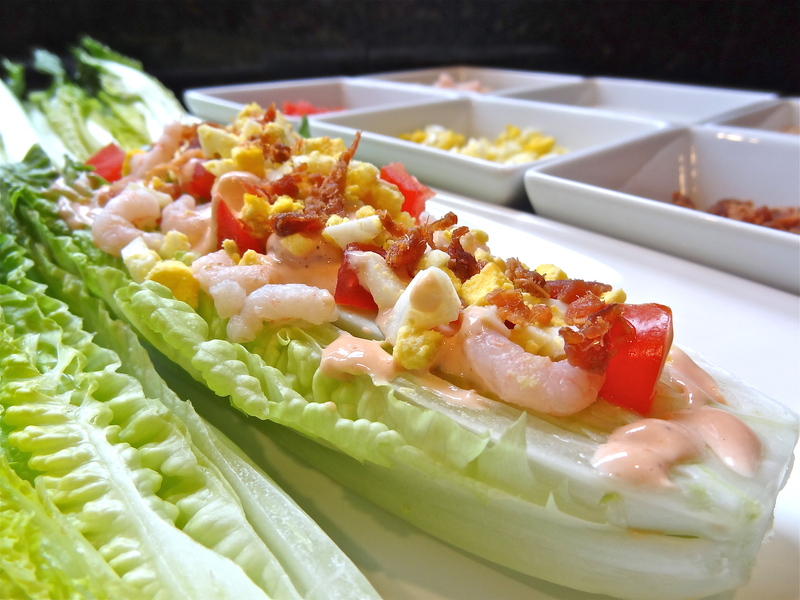 Picture half of a romaine heart sprinkled with fresh bay shrimp, bits of juicy, red, ripe tomatoes, chopped hard boiled eggs, crisp pieces of bacon, and drizzled with homemade Thousand Island dressing. It’s nothing fancy or anything original, but this salad shines on many counts. In a sense, it’s a delicious combination of a wedge salad and a chopped salad, but only better. Romaine lettuce is more nutritious than iceberg lettuce and the flat surfaces of halved romaine hearts are superior for holding toppings over a wedge. The toppings are also reminiscent of ingredients found in a chopped salad. It’s a versatile salad that can be prepared ahead of time and is beautifully served preassembled on a platter or on individual salad plates. For a larger group, this salad can be arranged as an appetizing salad bar. If you’re going the salad bar route, offer more than one salad dressing. For your convenience, I’ve included recipes for both Thousand Island and Creamy Blue Cheese dressings. 1. Cut romaine hearts in half lengthwise. Cut off bottoms of stems close to the ends (you want to keep as many leaves attached as possible). Cut off top leaves, so that all hearts are the same length. These tops can be washed and saved for another salad. 2. Carefully place two romaine halves at a time in a salad spinner filled with water. Let sit a bit, pour out water and spin dry. 3. 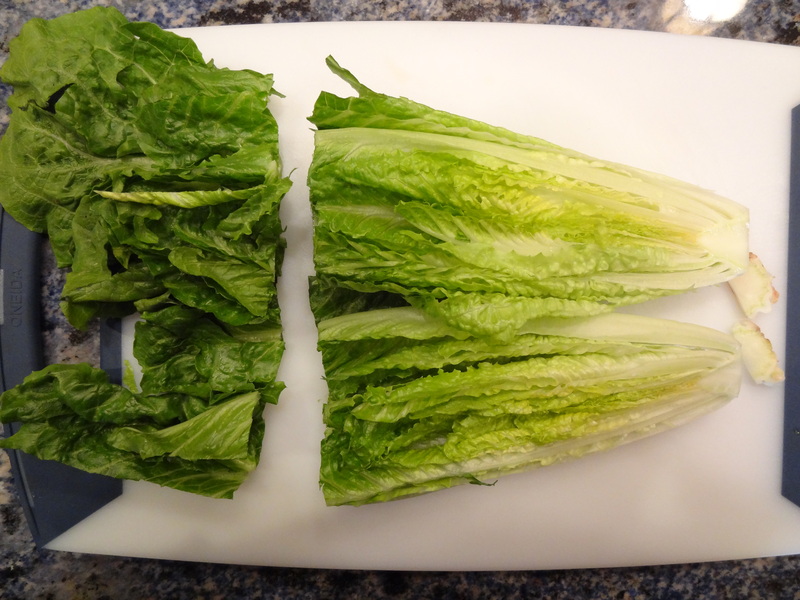 Place romaine halves, cut side down, in an airtight square or rectangular container with paper towels lining the bottom. Add more romaine halves until bottom of container is covered. Cover with another paper towel and then the lid. If storing many romaine halves and the container is deep, place a layer of paper towels over the first layer of romaine halves, add more romaine halves, again cut side down on top of paper towels. Repeat this layering process until all romaine halves are carefully stored. Store container in the refrigerator. 4. Prepare salad dressing(s) and refrigerate. 5. Prepare toppings and refrigerate those that need refrigeration. 6. To plate salad, either place one romaine half on a salad plate, sprinkle toppings over it, and drizzle with salad dressing or arrange all romaine halves on a large platter and sprinkle with toppings and dressing. For a salad bar, place romaine hearts on a platter and place toppings and dressings in small bowls. 2. Place dressing in a covered container and refrigerate for several hours, stirring occasionally, so that the sugar dissolves and the flavors blend. 1. Mash softened cheese with fork in a bowl. 2. Whisk in the cream and sour cream onto cheese, the consistency should be smooth with an occasional small bit of blue. 3. Season with salt and pepper and cayenne pepper. Refrigerate. 1. At a recent party I hosted, I served this salad as a salad bar. Not knowing everyone’s likes and dislikes, I felt it was better to let my guests add their own toppings. About one hour before my guests arrived, I removed the romaine halves form the storage container and arranged them on a platter. I also spooned the toppings and both salad dressings into small bowls. All were covered with plastic wrap and refrigerated until serving time. 2. Do not limit yourself to the toppings listed above. Substitute ingredients to suit your own taste and incorporate seasonal items. For example, use fresh crab meat instead of shrimp, or if fresh corn is in season, by all means use some fresh sweet corn kernels as a topping, etc. 3. I did not add very much salt to the blue cheese dressing because the cheese was already on the salty side.